Following on from the previous post, where we had observed how good Wellington can get on a nice day (not so good today, unfortunately), there were a few photos left over that we just had to use. 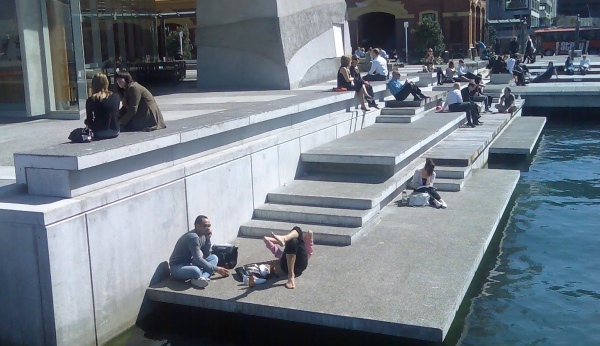 There seems to be a few simple principles at work here for successful public space design in general, but throughout the waterfront especially. 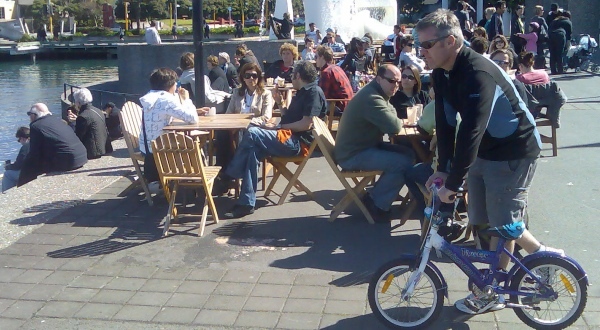 Allow a variety of seating positions and protection away from the wind, and into the sun….. this place is perplexingly popular, not just with prone pedestrians but also with tiny skateboarders, too shy to battle with the big boys at the proper skatepark down the road. Weekends plus sunshine = parents plus perambulators. A good children’s playground never goes amiss it seems. Have somewhere where you can eat ice-creams, by the sea, in the sun…. this is the ever popular lagoon watching spot, but really its a cold and windy spot for most of the day, and icy cold in the shade of the edge of Frank Kitts Park. Its a good thing its all due for a redesign. The outdoor seating next to Wagamama is used so well it looks like an architect’s sketch come to life (something that is yet to happen with the parks alongside the bypass). 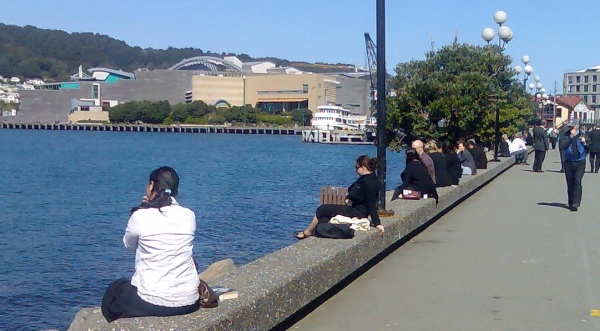 I like how people will sit by the lagoon on a cold weekend afternoon, eating cold ice cream, but somehow it’s not unpleasant as long as it’s a cloudless day. Maybe if it looks like summer, that’s enough. (Also, Kaffee Eis does really good coconut ice cream). Mr King of the World also looks like he’s recreating Solace in the Wind, only with pants on. And, Maximus, note: you’ve used up your October allocation of P-based alliteration. Rats. And its only the 5th, too. Pedestrian’s perfect plagiaristic plank pose. Too many P’s Robyn? I was trying to think of more P words for “tiny skateboarders” but failed dismally. But yes – I’ve noticed how the outdoor seating at Wagamama / Mojo is ever-popular – I think its a combination of no cars, no wind, and suntrap. We need more spaces like that around the city. I was trying to think of more P words for �tiny skateboarders� but failed dismally. Petite Powell Peralta pushers, perhaps? Powell Peralta – I am impressed ! Who’d have thunk it.